Come celebrate on Thursday, June 22nd, 2017 as the Town of Winter Park unveils the brand new Hideaway Park Stage! 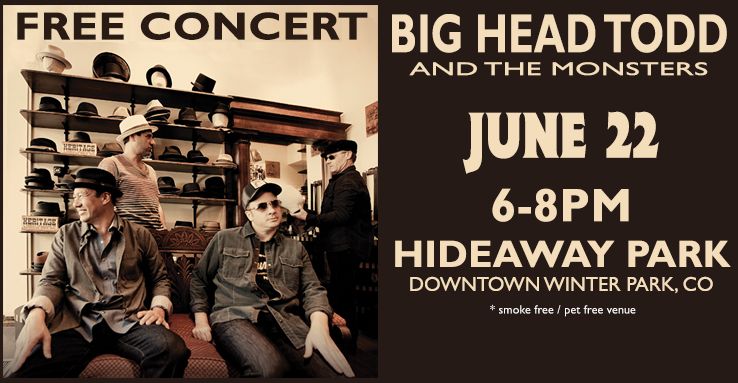 Enjoy a FREE live concert with Big Head Todd & The Monsters, 6-8pm! Join us EVERY Thursday from 6-8pm at Rendezvous Event Center at Hideaway Park, downtown Winter Park and enjoy a mix of musical styles performed on our brand new state-of-the-art stage from June 29-August 24. Bring your picnic, favorite beverages, and a smile, we provide the chairs and live music (please leave your pets at home). That means there will be no concessions at the park! Feel free to pack a basket full of snacks and drinks to enjoy along with the live music, community vibes, and mountain backdrops! Learn more about the Brand New Stage by Clicking Here! Don't just come for the day, join us for a LONG weekend of fun in the mountains! The weather is incredible and Trestle Bike Park and Bike Granby Ranch are open for the season, in addition to the 600+ miles of trails located in Mountain Bike Capital USA! Enjoy Hiking, Biking, Rafting and more in Colorado's Favorite Playground! Click here for all Summer Activities! Also, check out Lodging Deals so you can stay for the entire weekend! There will be live music at Cooper Creek Square, Winter Park Resort, and several local businesses on Friday night, followed by the Blues From The Top 15th Annual Blues Festival on Saturday and Sunday. New regulations at Rendezvous Event Center at Hideaway Park. NO PETS at concerts or festivals. This includes the High-Note Thursday Concert Series. Grand County Pet Pal's Doggie Dash, June 17 in Granby. On-going Live Music in Summer! Start your 4th of July celebration right and join us in beautiful Winter Park, Colorado's favorite® Playground, for the Rendezvous Run for Independence 5 mile run/walk. Sign Up For the Run for Independence! Find out about more Winter Park Summer Fun by checking out the Event Calendar!